Are you young leaders or young entrepreneurs willing to use mindfulness to foster sustainable world peace? Do you feel that your startup or organization need support to improve and move to its next stage? Do you think that you don’t have enough financial support from local organizations and want to reach more people in your community? World Peace Initiative is proud to announce its Mindfulness Grant for the Community intended for young leaders and entrepreneurs! World Peace Initiative (WPI) is an international non-profit organization headquartered in Thailand. Our activities are based on the firm belief that world peace can be achieved, if each of us works first on achieving our own inner peace and then shares it with our family, friends, and community. World peace can then be achieved by using this model on a global scale. As you can see, we at WPI are very passionate about making a difference in the world so we focus our resources on supporting individuals and organizations at all levels that share the same goal and drive to make this world a better place. After more than 7 years working with the young leaders who participate in our meditation, mindfulness, and self-empowerment events, we can see a clear trend in what makes a social project a success. The success of a social project depends heavily on how well the inner aspects of the project are handled. In other words, change always starts from within. As an international organization, we think it is extremely important to reach out to local communities. This is why we are launching a grant program which aims at encouraging mindfulness-based social projects at the community level. All non-profit organizations, youth leaders, social entrepreneurs, peace activists, and anybody with an idea are eligible to apply for WPI’s Mindfulness Grant. The opportunity of having one of our certified meditation instructors as an advisor for the implementation of the mindfulness aspect of the program and as a trainer at no cost. The aim of the grant is to support projects that make a positive change in society and promote mindfulness and meditation as a tool to improve people’s quality of life. If the project is successfully implemented, the team will also be sponsored to attend one of our training programs or meditation retreats. 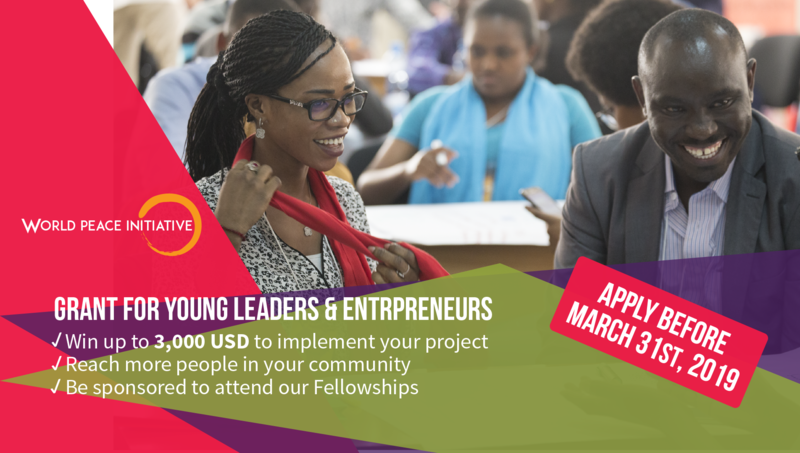 The top 20 applicants of the grant will be given preference to attend one of our Peace Revolution African fellowships in 2019 if they apply. All project applications must be submitted to molinge@wpifoundation.org together with 7 presentation slides that explain your proposal. The Committee will select the five best projects and the winners will be announced via www.wpifoundation.org on 30 April,2019. The winner will be the interview video with the most views, the winner will be announced on 25 June, 2019 ,11:59 PM GMT. Note: The winner must have no less than 5,000 views on their video. The project should be initiated originally by you and your team, not a copy of a previously implemented project and not something copied from somewhere else. The project can't be involved in any kind of trade of financial securities or cryptocurrencies. The project can't involve any kind of hate or harsh speech. This project can't involve the use of or promotion of intoxicating substances such as alcohol, cigarettes, or illicit drugs. How does the project contribute to the social, economic, and/or civic development of the applicant’s home country/city/region? Does the project meet the needs of the local community? Does the project benefit people from different ethnic, religious, social, professional backgrounds and age groups? Does the project include the use of meditation to help the personal development of the people involved? Is the proposal cost efficient? Does the proposal include cost sharing? Are partner organizations involved in conducting the project? Can the project be accomplished within the time frame? How realistic are the proposal’s expectations? Does your project have well-defined goals and objectives, which can be evaluated effectively? Does the project have a potential for future continuation? How will the results be shared with others? How many people will this project target? How will the project’s outreach occur? What social media tools will be used and what is the estimated reach? Will the project progress be covered in local/national media? What kind of dissemination materials will be prepared? As part of the application, grant recipients must provide a budget and budget narrative that accurately reflects the proposed costs of the project. Requests for changes to the budget or timeline after proposal submission must be submitted in writing to WPI for approval. 30% of the proposed cost - at the stage of project dissemination, reporting and accounting, to be given officially during a WPI summit or fellowship. All grant activities must be completed and funds spent before 10 October, 2019. 3. Grant recipients must have all the receipts of their budget and present at the end of the project in order to get the final installment of the grant. 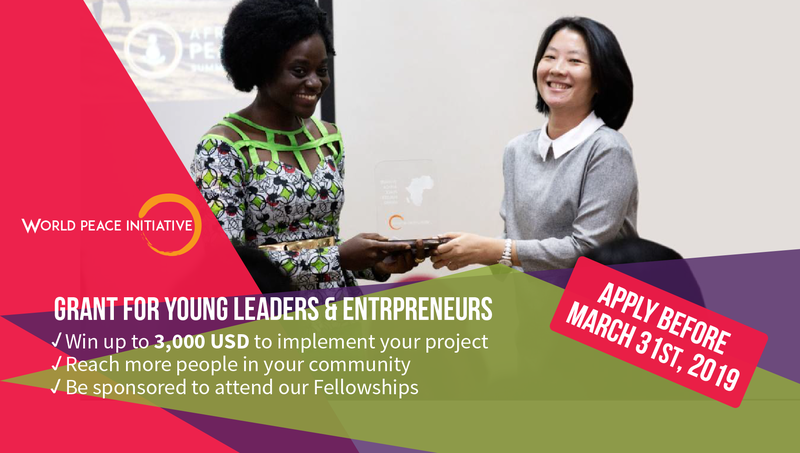 There are two ways to Apply.Either you apply via the website form or you can submit your project proposal in the form of 7 presentation slides (powerpoint or google slides) and send a separate budget and budget narrative to molinge@wpifoundation.org . Please choose just one method to apply! Must i belong to an organization before i can be able to apply? No, you need not belong to an NGO in order to apply.All we need is a person with a great idea. What do you mean by mindfulness and meditation? Meditation is the art and practice of calming our mind by focusing the mind at one particular point as long as you can follow simple methods taught in the 42 days Self Development Program. It is not a requirement to start the SDP to apply for the Grant. Mindfulness is the practice of being present, focused and attentive with each task that you do. When one practices meditation, they gain access to being mindful (diligent/keen/peaceful), and present in their life, business, organization and civic engagement. Mindfulness and Meditation as a non-religious tool has been found to have tremendous health and social benefits. Any example of how i could include this in a project? Meditation Breaks: Where the team can take a 15-30 minutes break to practice meditation within the work schedule so as to manage stress and increase productivity. e.g Employees at Google do this practice. Mindfulness Reminders: The Organization may have hourly reminders to pause the mind for 1 minute and feel refreshed. World Peace Initiative Foundation has this practice within its offices. Be creative and have your own ways to incorporate meditation and mindfulness in your field of work. Can i submit a previously written project? No.The projects should be initiated originally by you or your team,not a copy of a previously implemented project and not something copied from somewhere else. Do i need to apply for any peace revolution fellowship or start the self development program in order to get the grant? It is not compulsory to do any of the above but everyone is encouraged to apply for any of the fellowships that they are eligible. For 2019, we will organize Alafia fellowship and Amandla fellowship in Africa. I am above 32 years, can i still apply for the grant? When will the selection results be announced? The top three will be announced on 15 June while the winner will be announced on 25 June. Applicants should ensure to provide complete contact information in their application files.